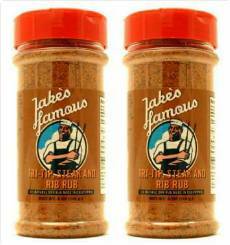 Jake's Famous Pure Santa Maria Tri Tip Rub spices and seasonings for your best tri tip, steaks and more. Born on the West Coast California this simple ingredient recipe has been and continues to be a long standing regional favorite. Imagine true redwood oak smoke and chuck wagon grills raising and lowering richly seasoned Tri-Tip roasts with Texas sized garlic bread and ranch style beans. It doesn't get much better than that and these all natural spices and seasonings will make sure you remember it. Easy to use and easy to apply hand selected blends of coarse grain Garlic, Black Pepper and Smoked Kosher Salt complemented with natural Parsley and rich hints of Onion and Mustard to bring it all home with this award winning dry rub flavor. Don't forget the napkins when you make the tastiest, juiciest, rich and flavorful Tri-Tips, steaks, ribs and more. Try this spectacular Santa Maria inspired Tri-Tip seasoning on steaks, ribs, chops, salmon, vegetables as a direct seasoning, turkey and more. Suggested Uses: Tri-Tip, hamburgers, steaks, ribs, chops, eggs, and as a general table seasoning. Pepper Mason wrote: "Great Santa Maria style rub from Jake. I lived in Santa Maria for 15 years and you really can't get a better original tri tip rub or as we say here Santa Maria Style rub than Jake's Pure Santa Maria. I like that he uses the large chips of garlic and smoked kosher salt along with coarse black pepper. Really excellent." G. Dixon wrote: " "I was camping when a friend pulled out your Tri-Tip Rub for Steaks. That is by far the best rub I have ever tasted." 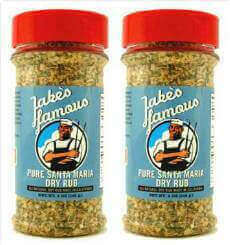 Get Jake's Pure Santa Maria Dry Rub Now!